Most couples plan a romantic date out the first time they hire a non-family babysitter, but my husband and I opted to visit Wegmans to shop for pizza ingredients. We sampled a couple of organic cheeses and landed on an aged cheddar cheese from Sonoma Creamery in California. 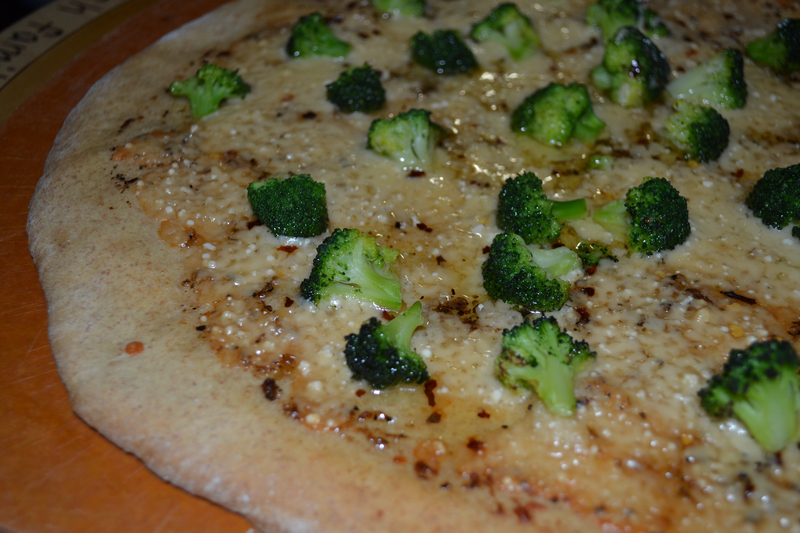 When you purchase such a rich cheese you don’t want to take away its intensity by adding too many toppings so the combination of white pizza sauce, broccoli, and a dash of red pepper flakes was the perfect combination. After pre-baking the dough, the cheese melted nicely at 450 degrees for 8 minutes. This entry was posted in broccoli, cheddar cheese, cheese, pizza, vegetarian, veggie, White Pizza Sauce with Oregano and tagged broccoli, cheddar, pizza. Bookmark the permalink.